I'm sure the smart advice from seasoned bloggers after a match like that is to wait before you put your thoughts out there for all to see but I'm new to this. The other thing is my thoughts won't be radical and full of blood lust but those of a fan who can see what's wrong and hopes it can be fixed. Stop me if I state the bleedin' obvious! It is hard to judge this team as it's not our first team. Having said that, any team 2-0 up with less than 10 minutes to go have to fall to quite low depths of crapness to even draw let alone lose. If ever there was a better example of snatching defeat from the jaws of victory I'm not sure i know when it happened. I hate using injuries as an excuse but it's all we've got. One area where we don't have injuries is in the goalkeeper department. Unfortunately they have been struck down with a bad dose of crapitis. Today our first choice, who should be our second choice, was dropped for our third choice with some people shouting for our forth choice to be our first. If anything positive comes out of today it will be a shiny new goalie full of confidence who can catch a ball. I'm so depressed by our goalkeepers anyone with a working set of gloves will do for me. Almunia clearly had been dropped today to see what Flapianski could do and he fluffed his lines big time and proved to us all his nickname is well deserved. I think the boy on loan who's name I'm not even going to try should be moved to reserve with an new man coming in. Manuel Faulty and Flapianski should be thanked, given a voucher for the club shop and moved on. Enough is enough. I don't have the energy after that to talk about the rest of the team although I thought Eastmont did OK for such a young man and my Twitter about giving Silvestre another 3 years after his goal was a JOKE! We now need to get to the end of the season the best we can. Man City and Blackburn won't be easy while I'm starting to hope Fulham get to the UEFA cup final so they go easy on us. Chins up Gooners. The first date of Silvestre's farewell tour was off key but progress has been made, we can't see injuries this bad again (can we?) and there is money in the kitty. August can't come quickly enough!! The disappointment over the loss - and the manner of the loss - still tears me apart. Worst part is that - as I tweeted just after the final whistle - mathematically we can actually trop out of the top four this season. And judging on the performances of our boys, and that of the 2 contenders below us - it is more than a mathematical possibility. In the span of just a few games we’ve gone from fighting for the title, to fighting for a Champions League place - or even the right to try and qualify for a Champions League place. We can blame Fabianski (and in several matches, Almunia). 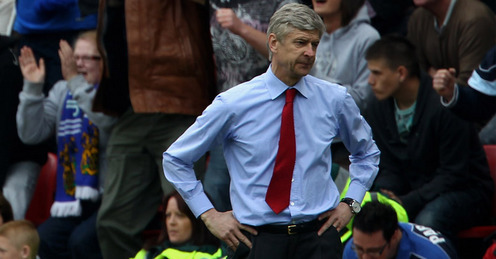 But while I am not to any degree suggesting that Arsene must go - absoluetly not! - he must take the major blame for today’s travesty. By replacing Rosicky and Walcott with Merida (!) and Eboue, and by obviuosly not planning on using RVP at all, he signalled to his players that Arsenal - for the first time in modern history - actually was going to attempt to defend the lead through defending, not through attacking, which is the Arsenal way, and which is the only way Arsenal can defend. PS: "Slivester" is not a lame attempt at giving the Manure cast-away a new, and in any way funny nickname. It is simply a double typo. Totally agree with you. The team looked tired and needed something to get us through the last 10 minutes and the subs Arsene made didn't do it. RVP would've scared Wigan. It feels like the whole place has run out of steam and can't wait for the summer but your concerns about finishing 3rd (or heaven forbid 4th) are feeling quite real.